The arch of Constantine is one of only three Roman arches that have survived in Italy. It was built in 315 AD and was used as a model for the Arc de Triomphe Carrousel (1806-1808). 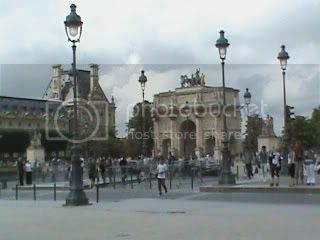 The Arc de Triomphe Carrousel separates the Louvre and the Tuileries Gardens. The similarities of these two structures consist of: a main arch flanked by two minor archways, four Corinthian columns on both sides, and decorated with reliefs and sculpture (Arc de Triomphe Carrousel alone). The sculpture atop the Arc de Triomphe Carrousel was first decorated with the horses from Saint Mark’s Cathedral in Venice, but was later returned after Napoleon’s defeat at Waterloo and the Bourbon restoration. The sculpture was replaced with an allegorical Peace riding in a chariot with Victories (symbol of the restoration of the Bourbons). Another famous arch in Paris is, of course, the Arc de Triomphe (it also began in 1806, but was completed in 1833). The Arc de Triomphe (translates as Triumphal Arch), with its central arch and reliefs from the French Revolution and the Napoleonic Wars, was modeled after the Arch of Titus (1st century Rome). It took an astounding thirty years to build and was finally dedicated in 1836 under the reign of King Louis-Philippe. Napoleon first began the construction of the Arc de Triomphe on Rue Saint-Antoine, but it was later moved to Place L’Etoile (the present day Place Charles de Gaulle), where Rue Champs Elysees begins. The tomb of the Unknown Soldier from WWI lies beneath the Arc de Triomphe. Surprisingly, in 1940, Adolph Hitler followed the French tradition by walking up to the arch and around it during his occupation of Europe. Its eternal flame so impressed Jacqueline Kennedy that she requested the same memorial for President John F. Kennedy’s gravesite in Arlington National Cemetery, the first time an individual was given the honor. Napoleon’s body was taken through the Arc de Triomphe when he died in 1821, on its way to its final resting place at the Invalides. Victor Hugo, French literary figure, upon his death in 1885, had the funeral procession begin at the Arc de Triomphe and end at the Panthéon, where he was laid to rest. You can own a photographic print of the "Arc de Triomphe, Night View, Paris, France."